Founded in 1902 and now one of Singapore’s largest firms, Allen & Gledhill started growing its international arbitration practice in the late 1980s under the leadership of former partner Michael Hwang SC. The practice now has 30 lawyers and is co-led by partners Chong Yee Leong and Dinesh Dhillon. Andrew Yeo heads the wider litigation and dispute resolution department. The firm has been recognised for its expertise in energy, infrastructure, construction and engineering disputes. It has handled cases at the Singapore International Arbitration Centre (SIAC) and the Asia International Arbitration Centre (AIAC) in Kuala Lumpur as well as ICC and UNCITRAL cases within and outside Singapore. The practice expanded significantly in 2013 with the hire of five partners from Rajah & Tann – including Chong Yee Leong, who had headed that firm’s international arbitration team. It also recruited former heads of the India and China desks at SIAC. Members of the firm have been closely involved in Singapore’s various dispute resolution initiatives. Former senior partner Lucien Wong, a much-respected banking and finance lawyer, was chair of the SIAC board of directors before becoming Singapore’s attorney general in 2017. Chong Yee Leong and recently retired partner Ang Cheng Hock SC were part of a committee that drew up the plans for the Singapore International Commercial Court, and the firm also has a number of members on the SIAC Users’ Council. Beside its base in Singapore, Allen & Gledhill works with associate firms in Myanmar and Malaysia. The Myanmar firm is headed by Minn Naing Oo, a former chief executive officer of SIAC who is qualified to practise in Singapore and New York. She was born in Myanmar, speaks the language fluently and has helped to draft the country’s new arbitration law. Clients on the public record include Sony subsidiary MSM Satellite in an ICC case over media rights for Indian Premier League cricket. It is also known to have acted for the Philippine National Bank and other financial institutions in a US$350 million SIAC case relating to a distressed steel plant; and for Lufthansa in a dispute with a Thai IT services provider. Lately the firm has entered the investment treaty arena, advising clients on claims against South East Asian states. Most of the firm’s cases aren’t public but it says it obtained a significant win for a US Fortune 500 company in a dispute with a government-linked natural gas supplier. It also acted for one of the world’s largest media and entertainment companies in an arbitration over media rights worth US$1 billion, with the client winning its case in full. Another win came in a US$145 million dispute over an investment in a Thai property project. It has also helped an Asian state-owned entity obtain a US$200 million award against a European bank, which had been represented by a top US disputes firm. In the Singaporean courts, it successfully defended a US$1.4 billion ICC award relating to an airport terminal project. Further back, it helped the Philippines defeat a US$565 million ICC claim by a German-led consortium over a concession to build and operate a terminal at the international airport in Manila, as co-counsel with White & Case. In 2018, the firm helped a subsidiary of Indian electric utility Reliance Power win a US$56 million SIAC award against a Seychelles entity and the owner of Indonesia’s Sugico Group in a dispute over three coal-mining concessions in Indonesia. It also had a defence win in a dispute between Japanese and Korean conglomerates over an urban metro project in Vietnam, securing the dismissal of all claims and winning more than US$60 million in counterclaims. There was an award worth more than US$150 million in favour of another client in a case conducted under the auspices of the Chinese Arbitration Association. The client was a company in receivership in a dispute with a bank that had been pledged its assets. It also successfully represented a Singapore oil and gas company in a dispute with a Korean logistics company over a deal to supply two reactors from Korea to Kazakhstan. Edwin Tong SC, who had co-headed the litigation and dispute resolution department with Andrew Yeo, retired from the partnership in mid-2018 to take up the position of Singapore’s senior minister of state for law and health. Around the same time, partner Ang Cheng Hock SC left to become a judicial commissioner of the Supreme Court of Singapore. Allen & Gledhill is one of the largest law firms in South-east Asia with more than 450 lawyers practising in offices located in Singapore, Malaysia and Myanmar. The firm has a long history of legal excellence stretching over 110 years. 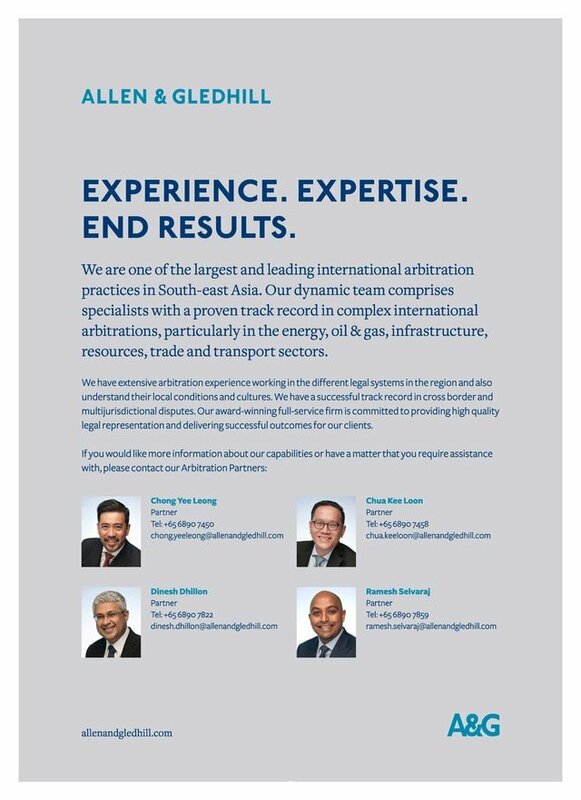 We have a large and dynamic international arbitration team that includes lawyers who have dedicated their entire career specialising solely in international arbitration. We set ourselves apart with our lawyers’ ability to take advantage of their appreciation of the unique local commercial conditions in the region in formulating strong persuasive cases. This has resulted in our proven track record in obtaining successful outcomes in large complex international arbitrations regardless of whether such proceedings are seated in Singapore or elsewhere in Asia. Our key clients naturally include global multinationals, leading regional companies and government bodies with dealings in the region. Our reputation as a top-tier arbitration practice is evidenced by our consistent and strong rankings in leading publications including Global Arbitration Review, Chambers Asia-Pacific and The Legal 500 Asia Pacific. We have received various awards and accolades from independent commentators and were named National Law Firm of the Year – Singapore at Asialaw Asia-Pacific Dispute Resolution Awards (2017), Litigation & Dispute Resolution Firm of the Year by Asian-MENA Counsel (2017 and 2016), International Arbitration Firm of the Year by Asian-MENA Counsel (2016) as well as Disputes Team of the Year at The Asian Lawyer Asia Legal Awards (2016).